Ho Ho Ho! It’s time to break out the egg nog for some JOLLY GOOD old-fashioned holiday cheer! You’ll be the life of the party after a few cups of this super loaded nog! Guaranteed to make you happy, happy, HAPPY and totally warm inside! My kind of Christmas drink! Our family began making homemade egg nog YEARS AGO after my sister and I went to college and were members of the Pi Beta Phi sorority where the recipe was shared in our chapter’s cookbook. Christmas Eve just isn’t Christmas Eve at our house without a fresh batch of this egg nog. I’m telling you that this is hands-down the BEST Creamy, Loaded Egg Nog . . . ever! We’ve never used any other recipe in decades. Doesn’t that spell ‘keeper’ to you? There’s so much booze in this egg nog that it nukes the contamination. You have to use the freshest of pasteurized eggs of course . . . none that have been sitting around the back of your fridge that you may have forgotten about months ago! When chilling this (it needs at least a week to ‘age’), make sure that you use bottles that are cleaned and dried on the hottest setting of your dishwasher OR as in canning, you can boil the empty bottles for 10 minutes to sterilize them of any bacteria. Separate the eggs and save the whites for later. Combine dairy and all of the booze in a second bowl or pitcher and then slowly beat into the egg mixture. Move to a large glass jar (or a couple of smaller ones) and store in the fridge for a minimum of 2 weeks. Serve in mugs or cups topped with a some nutmeg sprinkled on top. Wow I love that you make this from scratch! I have to give it a shot! Thanks for sharing. Thanks for your kind compliment and for your visit as a newbie to my (old) blog! Once you try homemade nog, there’s no going back to store bought! Now that is totally some loaded eggnog! Isn’t it the truth, Renee! Sipping small sips is definitely in order for proper holiday behavior! Wow, this is loaded and looks and sounds delicious! Oh my goodness, Shelby . . . if you only knew how much any cranberry recipe holds the keys to my heart! Grazie mille per la ricette, mia amica! Grazie mille for your kind visit ‘oggi’ (today! Sounds like an outstanding recipe and I can see why it comes with a prepare to be happy warning. A ‘happy warming’, if not ‘numbing’ feeling is guaranteed Larry! It’s been a while since I’ve made my own eggnog, but you are definitely inspiring me with this one! Thank you Ethel, no eggnog purchased in any store can rival homemade! No one ever offered me this glorious eggnog when I was at the Pi Phi house so many times all those years ago! Maybe it was just the alumns that were sipping it! It looks spectacular and perfect for all the holiday festivities. Yup, you got that right Liz . . . alums only . . . no booze in the sororities remember? Oh well, we made up for it when we graduated . . . no matter which sorority, huh? Go Hawks! I love an eggnog for the holidays, man does that look good!! Grazie Tara! Homemade nog is simply the best! So cool that you made your own eggnog from scratch. It looks fantastic!!! Thank you Ms. Wimpy! It makes all the difference in the world to make nog from scratch! Sign me up for this one! I have never tried eggnog before and I’m pretty sure I need to go all in on my first sip! Yes, jump right in and really feel the joy, Ala! I love how you “mature” this one over a week – Im sure that makes it even better!! Yumminess! Love you made your Eggnog from scratch! Oh my!! I just need 2 or 3 of these and I can forget about the holiday craziness! Cheers to our sanity, sister! Thank you to you AND the sorority. Any recipe that’s kept since college has to be the best. Nothing like sorority girls getting together and knowing high quality and effective alcoholic beverages, Maureen! A heavenly beverage! Wonderfully creamy and spicy. I thought you would have used the bottled egg nog! 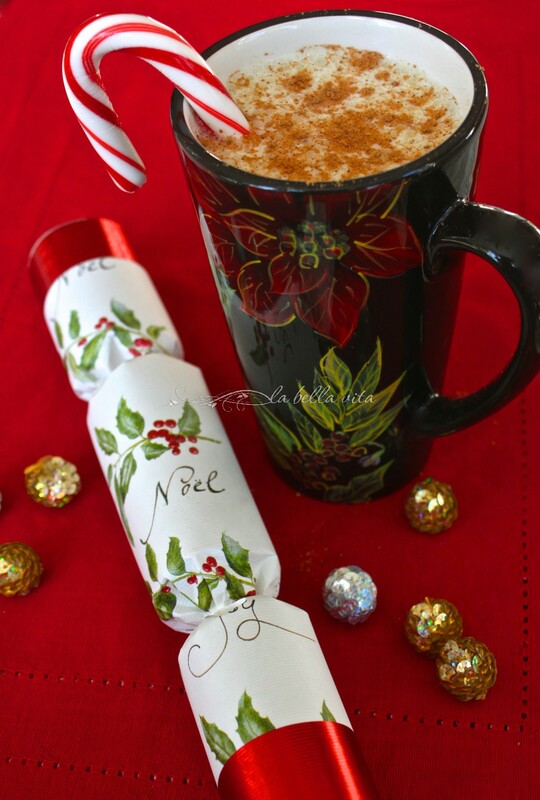 You rock, Roz, making this creamy festive drink from the scratch. Thumbs just for you! From scratch egg nog is so much better than the stuff found in the stores! This must be a very special eggnog Roz, with all those great ingredients. My dad always made it from scratch too, with tons of booze, and put it in the freezer. The alcohol would keep it from freezing, but it attained small ice crystals that gave a great texture when drinking (eating) it. Kind of like a alcohol laden slurpy. Buon Natale. What a great idea to put the booze-laden nog in the freezer! I wish you a most blessed Christmas Linda! I love how much booze you put in this drink! I tried homemade eggnog a few years ago and it completely flopped on me (and made people sick – yikes!) but I will have to try again with your recipe, because it sounds absolutely dreamy. Oh Julie, I’m sorry that your nog didn’t work out the first time; make sure you sterilize everything and keep it cold, cold, COLD! Thanks for stopping by and Merry Christms! Woo hoo, Roz! That’s one fine eggnog recipe! I would definitely make this with all that booze. Great pic too. Thanks for the recipe. Cheers! Cheers, ching ching and salute to a beautiful Christmas and 2015 to you Pam! I love eggnog! This sounds just perfect! Thanks Amee, eggnog is just so Christmas! Now THIS is quite a nog recipe! Loaded is definitely the word I would use to describe it! Glad you like it Joanne! It is just that! LOADED! A recipe that you’ve had for that long and continue to use does speak volumes about how good it much be! I’ve never tried making homemade eggnog but would love to give this one a shot. I love that it is made ahead of time to ‘age’ it. Cheers and Merry Christmas! Susan, Jump right in and enjoy the homemade goodness of eggnog made from scratch! Incomparable! Sounds delicious Roz , even though we are not too fond of eggnog – but yours is one we’d like to try! Hi Liz and Anna, eggnog certainly isn’t for everyone, but I’m sure you’ve got a good Christmas libation that you enjoy! Wow, does this sound good! I never thought I liked egg nog because I only had tried the store-bought kind, and actually didn’t even know about making it from scratch. Then about 15 years ago my aunt encouraged me to try her homemade version, and I fell in love with it. So different from the kind you buy! I have a question. Why do you have to let it sit for at least a week? What does that do? Just curious about that. I’m thinking maybe I could put some red food coloring in it and make it for Valentine’s Day? I just don’t know if I want to wait to make this until next Christmas! :) Thanks for this wonderful recipe, Roz!